Most golfers can vividly remember their first birdie. 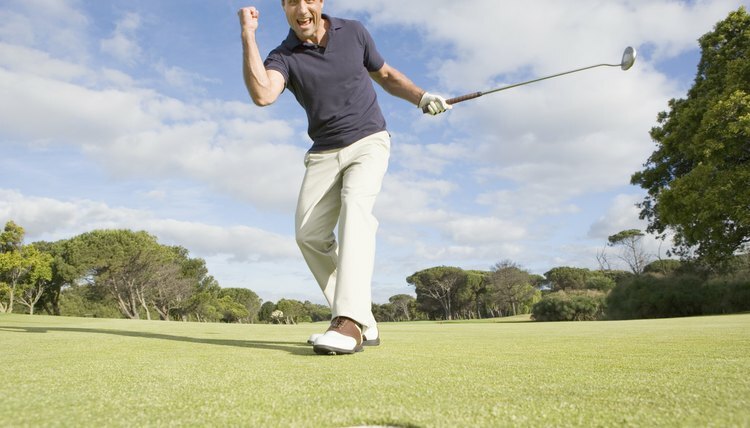 Scoring a birdie during a game of golf is an accomplishment that typically arises through skill and experience, although it's also occasionally possible to make a birdie through luck. A birdie is a score of one shot below par and is possible on any hole. For example, a score of a 2 on a par-3 hole is a birdie, while scoring a 4 on a par-5 is also a birdie. If there were an infallible formula for scoring a birdie, there wouldn't be much point in playing the game, but there are things you can work toward to improve your chances. Hit a long, straight drive off the tee to set yourself up favorably for the hole. Whether you're playing on a par-3, par-4 or par-5 hole, the tee shot is vitally important. It should be straight and land on the fairway, unless you're on a par-3. In this case, the tee shot should land on the green, as close to the hole as you can manage. Use your putter for your second shot if you're on a par-3 hole and have landed on the green with your first shot. Sink the putt to score a birdie. Select the appropriate club for your second shot if you're on a par-4 or par-5 hole, and hit it straight and as close to the hole as possible. The club you choose depends largely on the par of the hole and your ability. On a par-5, for example, your club choice for your second shot should be a long iron or fairway wood to get you as close to the green as possible. On a par-4, you might use a mid-iron, or possibly a wedge, depending on the distance of your drive, with the goal of putting your second shot on the green, close to the hole. Use your putter for your third shot if you're on a par-4 and have made it onto the green. Sink the putt to score a birdie on the hole. Place your third shot, if playing on a par-5 hole, on the green. A par-5 hole is the only type of hole in which you can take a third shot without holing out and still have a chance at a birdie. Line up your ball on the green and sink the putt as your fourth shot on a par-5 to finish the hole one stroke under par.